We are not a privileged bunch who get to relax over the weekends. There are the extra curricular activities to have to rush to with the kids, grab a quick lunch, finish our chores which we cannot do over the weekdays, sometimes meet friends in the evening or we have other places to go; the weekend is just gone by too fast and the Monday morning blues are already breathing down out neck from the Sunday afternoons. Last weekend was different. It feels awesome sometimes to have no plans, no one to meet, and if possible nothing to do. We even forced ourselves to keep aside the pending work and forget about it; instead we curled up all together and woke up later than usual. 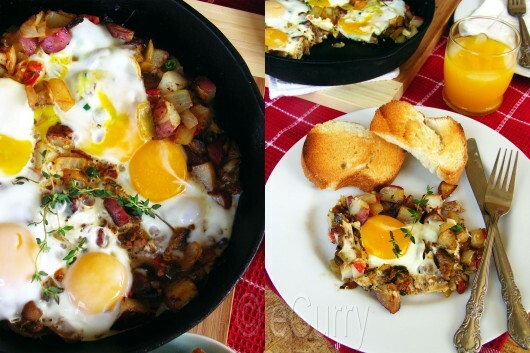 We were too lazy to go out to eat and settled for this easy but delicious Skillet Eggs. During the first years of our marriage I remember one time when we were going to have a lot of overnight guests. I was no expert in the kitchen, and did even worse with others looking over my shoulder to see what I was doing. This entire situation of having to make a big brunch for a house full of people, attend to them and also be ready by 10 in the morning to spend the day outside made me desperately whine to my dear friend M. (Here where I am right now, I have all my sympathy for the 21 year old, don’t you? 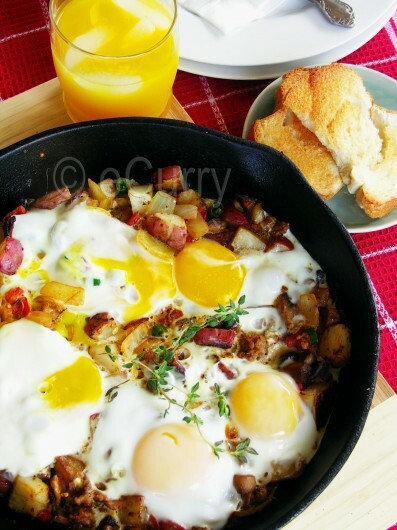 😉 ) She had suggested the eggs and vegetables in a pan; no cooking the individual eggs, no hash browns and sides in the oven, just throw everything in the pan and top it with numerous eggs and the breakfast/brunch is ready for all. It all went really well. So my friends, this is an evolution from her recipe. Heat a 12 inch Iron Skillet. Add 1 tablespoon oil and the potatoes and cook while tossing till the oil coats the potatoes. Cover and cook till the potatoes are still very firm but fork tender. Increase the heat, sprinkle some salt and pepper and cook them till golden and crispy. Remove from heat and set aside. Coat the same skillet with oil. Add the mushrooms and cook till all the water is evaporated and the mushrooms slightly brown. Sprinkle some salt when just about done. Remove from heat in a bowl and set aside. In the same skillet add 1 Tablespoon Oil. Add the sausages, crumble/break with the back of the spoon and cook over moderate heat, until completely cooked through and lightly browned. Add the onion, hot pepper and tomato and cook, stirring, until onions and tomatoes are softened. Return all the other cooked ingredients to the pan, sprinkle some thyme and toss to combine. Drizzle about 1 tablespoon of oil on them; spread them around so they cover the base of the pan completely in a single layer. Crack the eggs on the spread. Cover and cook on the stove top till the egg whites are just set but the yolks are still runny. Alternative way/Oven Method: After placing the eggs on the mix, put the skillet in a preheated oven (at about 375 Degree F) and bake till the eggs are set. Meeta is calling for Brunch Recipes for her Mingle this month. I dreamed to do a lot a for this; a mushroom quiche, a pear tart, some lovely lovely crepes or some sugar dusted cinnamon rolls…well guess what? Did not get to do any of those. This Saturday we had the eggs and a whole lot of good time as a family. My Skillet Eggs are going to the Mingle. A lovely relaxed weekend morning, a lot of cuddling with the kids, gorgeous sunshine and warmth, some sunny yellow eggs and vegetables that made a hearty full brunch and a lot of laughter… can’t be more blessed. Looks delicious dear. Loved the color so good. Thanks for shating the recipe. A hearty meal with beautiful colours. 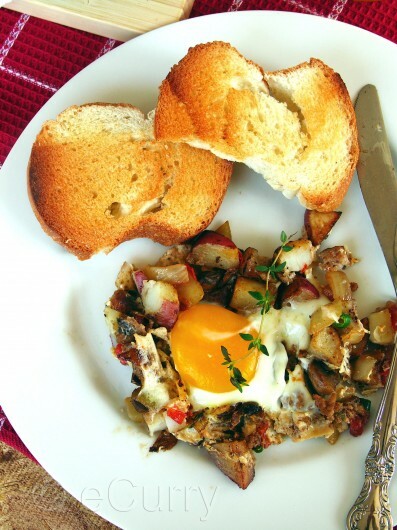 I always loved eggs, mushroom and potatoes and these days am loving quick recipes the most …what else can I ask for Soma? Delicious and the colour of the dish is so bright…doesnot take time to cheer everything up. I absolutely support you about this matter, if somebody looks at what I’m doing, I also create the worst thing :(. The preparation looks absolutely yummy, definitely trying this out for this weekend. Great entry for the event :). Yes, Soma get away from the scheduled life with a brunch like that is a fantastic idea. The bulls eye with toasted bread reminds me of my hostel days. Was a regular Sunday breakfast which my friend adored. It is lunch time for me here and that combination is just killing me 🙂 Gorgeous pictures. That looks brilliant! So appealing and some of my favourite ingredients all thrown together too. Perfect Sunday morning food. I made egg dish too for brunch the skillet with poatato and egg make me hungry! A delightful dish! Comforting and really tasty! what a inviting and yummy platter. oh yeah! this looks yum! a perfect breakfast – hec i’d take this anytime of the day. lovely pictures too! I can imagine dipping into that soft egg yolk with my bread and enjoying this wholsome breakfast. Perfect weekend breakie! Looks totally satisfying and delicious. what a wonderful recipie….I was in Holland last year, and I remember eating something similar in a road-side open restturant…but this is much more ingrediant, much more healthier n looks much more beautiful ! Wonderful breakfast recipe!! I love eggs and that dish looks fantastic. oooo the oozy yolk looks amazing! Sometimes I too love those simple and nothing to do weekends….it’s bit relaxing at times…love that innovation recipe….looks yum…. 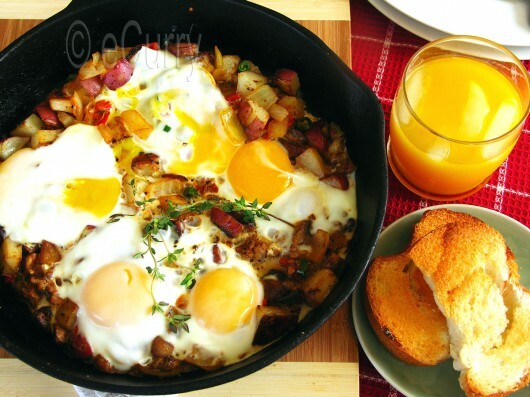 love those lazy weekend mornings…these eggs look so delicious. what a lovely post. just perfect. I wish my weekends could be lazier than they usually are, but I do get at least one big breakfast in each weekend. This looks perfect, and I love that it’s all made in one pan. What a simple but inspired idea! I love it and have to give it a try. Soma, I made this for bfast yday and my family loved it. I didnt have mushrooms, so substituted that with green peppers. It came out very good. Thanks for the recipe. Girl!!!! Now you make me want to have that! Yes, you must come and visit! Oh WOW! My husband will go crazy for this, so guess what I plan to serve for breakfast/brunch this weekend… 🙂 Gorgeous! O this looks soooo delicious and in fact perfect for our late brunch coming sunday! We have been thinking about doing an egg dish and this sounds just like the thing to make! Delicious! That sounds every bit as nice as it looks ! Those types of weekends are my favorite ones, but unfortunately I haven’t had one of those in a while! It’s such a great feeling when you know there is nothing to rush for. Your post just made me want to cook this now, but I don’t have all the ingredients. I will try it one morning and let you know the result. Wow. This looks absolutely amazing. Breakfast is where I seem to struggle, always making the same things so I am constantly looking for new recipes to try. I love this idea, all of those tasty things and all cooked in the same skillet. It sounds like the perfect breakfast to me. Thank you for sharing! Me and My man Loved this…Thanks a lot!! Tried this today – added fresh rosemary and also some leftover stuffing……..it was fabulous! So happy that you got to try this and liked it too! Creamed Mushrooms with Poached Eggs from Never Enough Thyme — Never Enough Thyme - Recipes with a slight southern accent.